EWB Boston Professional Chapter implements sustainable projects in partnership with developing communities. Engineers Without Borders Boston Professional Chapter (EWB Boston) supports water supply projects in the villages of Mapinduzi and Mkutani in Tanzania. E. coli is a critical parameter needed to assess the safety of the source water in each community, and to test the safety of water within a rain water catchment system EWB Boston installed in 2104. EWB Boston needed an affordable, transportable E. coli water quality testing procedure they could conduct themselves, without the costs or logistics involved with testing in third-party labs. 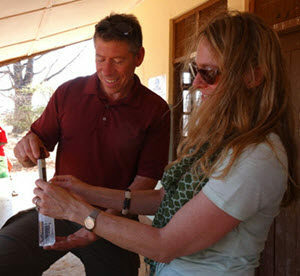 Bill Clunie, Water Supply Engineer and Barbara Piper, Tanzania Team Leader selected the Aquagenx Compartment Bag Test (CBT) because it is optimized for on-site testing and eliminates the need for labs, which can be costly and are often inaccessible in rural areas. Clunie and Piper worked with Tanzanian community members who staff the village health dispensary and operate the borehole pumping system. Together they collected field grab samples of untreated source water (river and borehole water) with the CBT Kit, as well as water from the rain water catchment system. The river source water was found to be unsafe, as they expected. However, EWB Boston and community members were very pleased to find the rainwater catchment system water was safe. The CBT’s quantitative, color-change test results for E. coli easily enabled everyone to analyze samples from a diagnostic point of view to accurately assess the extent of the health risk of water supplies. Clunie and Piper left remaining CBTs with the villagers to monitor water quality themselves on an ongoing basis. Since their initial testing with the CBT Kit in 2015, EWB Boston used the CBT in Tanzania during a subsequent trip and plan on using it again in future trips to Tanzanian communities.